Answer: What and why are Thanksgiving traditions? I wrote the Thanksgiving SRS Challenge before answering the previous one (about California fire data). I'll answer that one later this week to catch up. But today, let's talk about Thanksgiving. 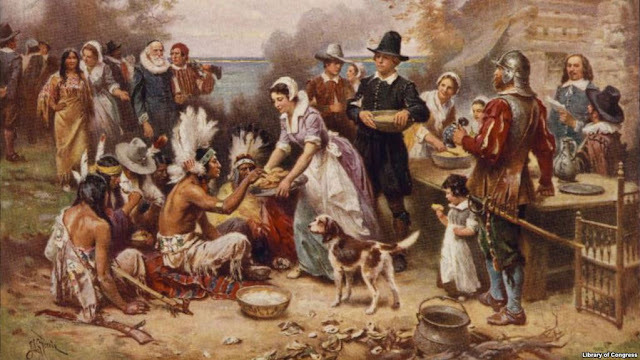 A painting by Jean Leon Gerome Ferris titled 'The First Thanksgiving' shows pilgrims and Native Americans gathering to share a meal. 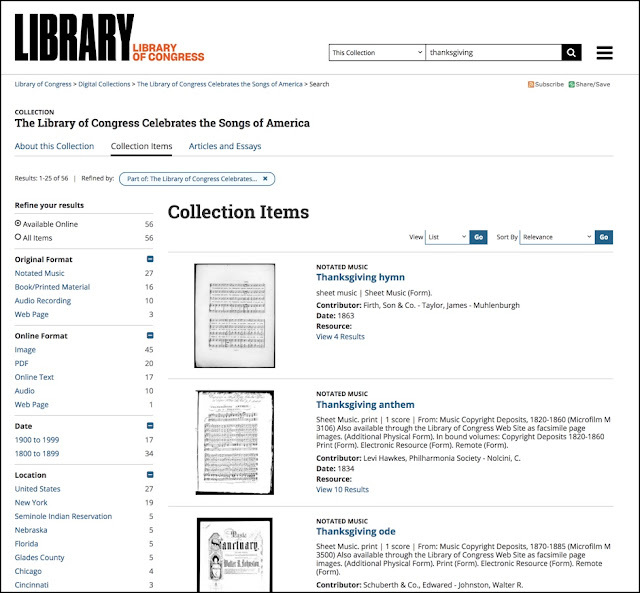 Copyright Library of Congress (CC by Attribution) As we learned in an earlier SRS post, the first Thanksgiving probably wasn't really like this. 1. I know Canada and the US celebrate Thanksgiving each fall. 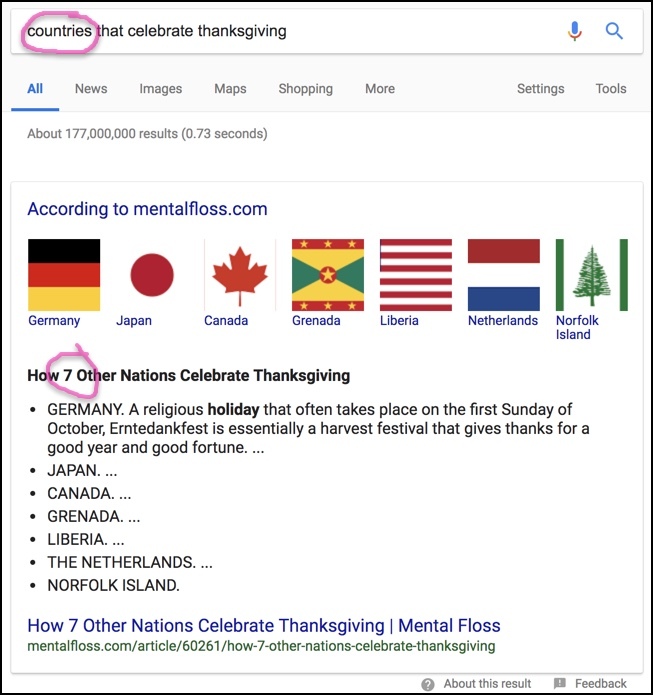 But do any other countries celebrate Thanksgiving (or equivalent holidays) as well? If so, what are they called, and when are they celebrated? 3. Speaking of ritual foods (turkey, cranberries, etc.)... what ritual songs are associated with the holidays? Many other holidays have associated songs--why not Thanksgiving? What am I missing? If you follow the link to the MentalFloss.com page, you'll learn that they have 7 countries listed. 1. Germany (first Sunday of October). Erntedankfest is a harvest festival to give thanks for a good harvest. Preferred foods are specially fattened up chickens (die Masthünchen) and hens (die Poularde), capons, and geese. 2. Japan Kinrō Kansha no Hi the Japanese feast day on November 23. Originally from ancient harvest festival rituals named Niinamesai, the modern meaning is a celebration of hard work and community involvement. 3. Canada – much like the US version but on a different day. Canada celebrates Thanksgiving on the second Monday in October. (In French, it’s l'Action de grâce.) It was first celebrated in 1578, when English explorer Martin Frobisher gave thanks in present-day Nunavut. Parliament made it a national holiday in 1879. 4. Grenada version of Thanksgiving is held on October 25 every year, Grenada's Thanksgiving marks the anniversary of the 1983 U.S. military invasion to restore order after the death of communist leader Maurice Bishop. American soldiers who were stationed in the country told the locals about the upcoming US Thanksgiving holiday. To show their own gratitude, Grenadians surprised the soldiers with meals like those they described, complete with turkey and all the fixings. 5. Liberia celebrates a version of the US Thanksgiving (recall that Liberia was founded in the 19th century by freed slaves from the U.S. Here, it’s celebrated with cornucopias (literally!) of fruit baskets (bananas, papayas, mangoes, and pineapples). 6. Leiden (in the Netherlands) celebrates a version of Thanksgiving in recognition of the early Dutch migrants who left Leiden in the early 1600 for the New World. Today, the people of Leiden celebrate a Thanksgiving day on the fourth Thursday of November with cookies and coffee following a non-demoninational church service. 7. Norfolk Island (a remote island in the South Pacific between near Australia also owes its Thanksgiving holiday to visiting U.S. whalers visiting the region in the middle 1890s. Today, on the last Wednesday of November, the locals bring fruit and vegetables to the church to celebrate the Thanksgiving holiday. 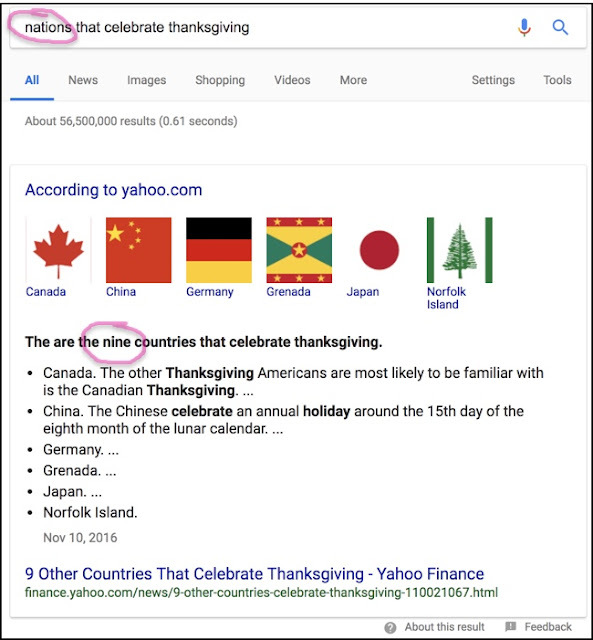 But if you change the query slightly (change "countries" to "nations") you'll find that the result says that there are 9 countries that celebrate some form of Thanksgiving. 9. South Korea celebrates a holiday known as Chuseok Day. Held in mid-to-late September, it’s a family holiday with a meal together and special memories of ancestors. So... why the differences? Because each answer is generated by extracting a block of text (an "answer") to a question (that is, your query) that best matches. In this case, the difference between nation and country was enough to find two rather different answers from question-answering pages. If you keep varying the details of the queries, you'll find a bunch of other harvest-time traditions. As you read, you have to ask yourself... what actually counts as a Thanksgiving festival? For instance, it's pretty clear that place like the Phillipines, Viet Nam, and Saint Lucia all have roughly equivalent holidays. Places like Brazil have a holiday called "Dia de Ao de Graas" which is also held on the fourth Thursday in November--but it's not celebrated by the entire nation. So.. is that a Thanksgiving holiday, or no? Likewise, Malaysia celebrates the Kadazan Harvest festival. that led me to this relatively full set of songs! 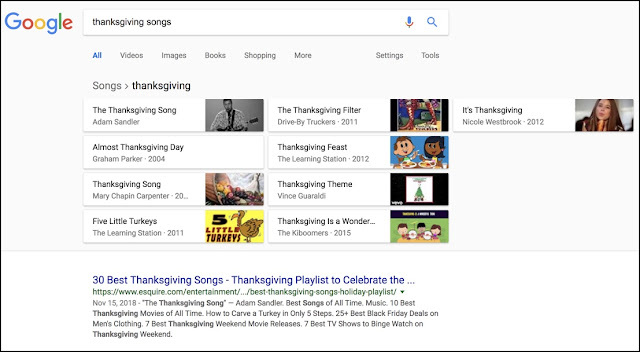 I certainly had no idea that there were so many Thanksgiving songs. 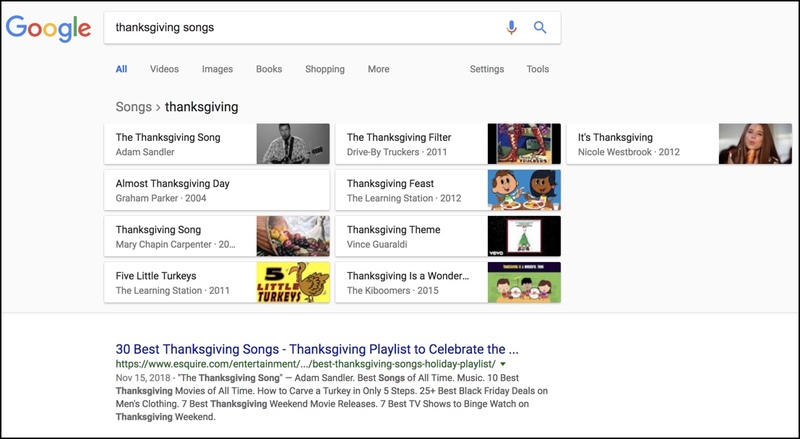 Perhaps we need to start a new tradition of Thanksgiving caroling! I found that there was a long tradition of Thanksgiving music, now lovingly preserved in the Library of Congress archives. 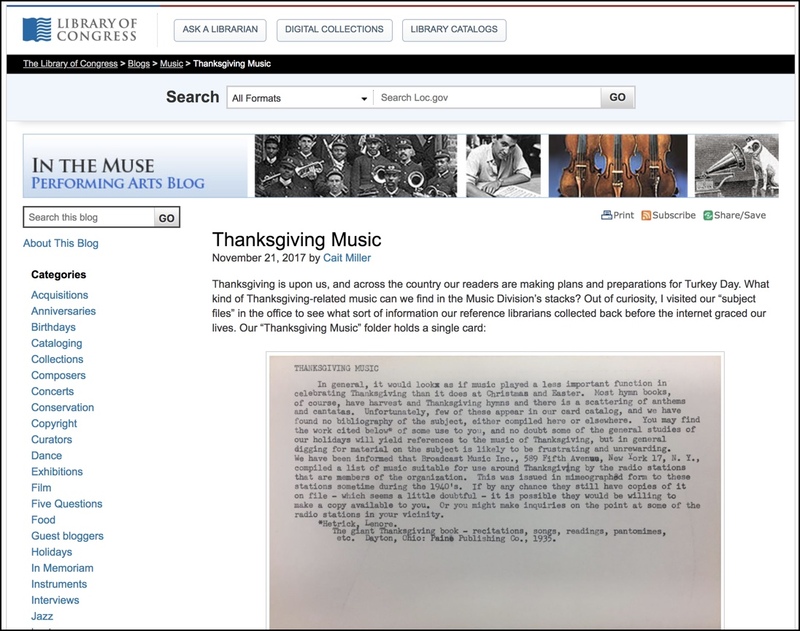 "In general, it would look as if music played a less important function in celebrating Thanksgiving than it does at Christmas and Easter. 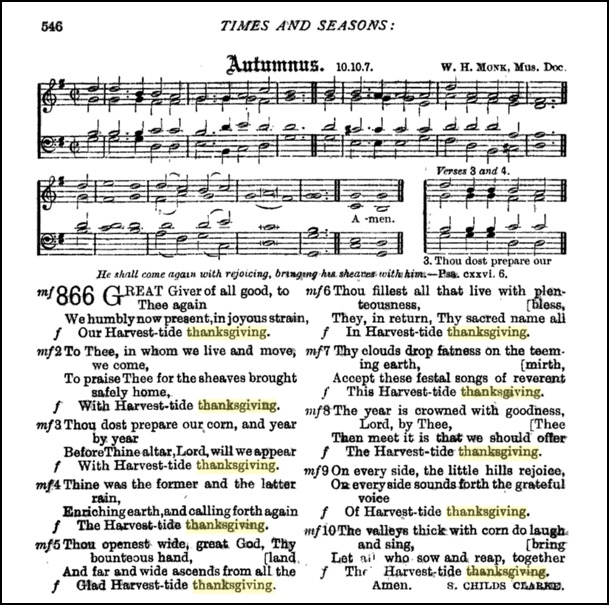 Most hymn books, of course, have harvest and Thanksgiving hymns and there is a scattering of anthems and cantatas. Unfortunately, few of these appear in our card catalog, and we have found no bibliography of the subject, either compiled here or elsewhere…. But in general, digging for material on the subject is likely to be frustrating and unrewarding…"
Even Wikipedia had a section on Thanksgiving songs. Who knew? 1. Vary the search terms. As you saw, "nation" vs. "country" can give different results. As a general strategy, I often will do slightly different versions of a query in order to get a sense of the range of answers. I rarely do only one query. 3. Always check Wikipedia for breadth. It's easy and quick... and sometimes you'll get surprised. 4. When searching for historical topics, check historical sites. 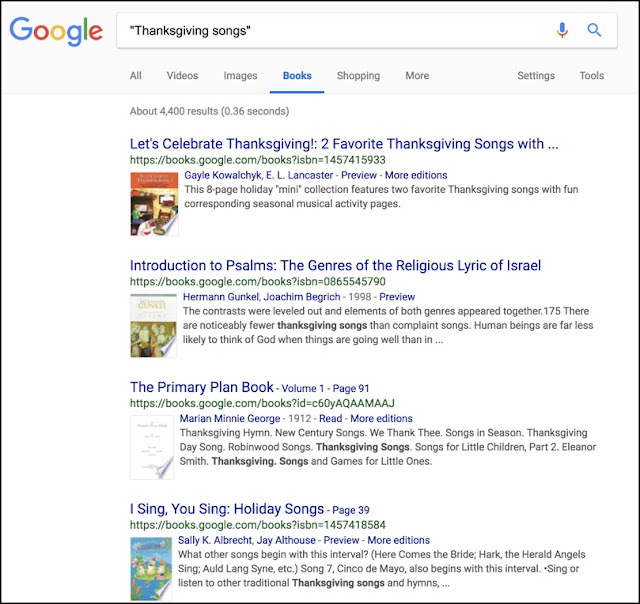 I did this by searching in Google Books, and in particular, checking for hymnals on the Books site to get a sense of the depth of the topic. And, in particular, checking the site:LOC.gov is a fast and handy way to get another perspective on your topic from an archivist's eye. Answer: Is this a safe treatment for caries?